How and Where to Buy Myrbetriq? Myrbetriq is available online through CanadianPharmacyWorld.com at the best prices. Our Canadian Pharmacy offers brand and generic medications online and over the phone through Canada and other international pharmacies. A valid prescription is required for all RX medications. For more information and further details about ordering, please refer to our FAQ or call Customer Service at 1866-485-7979. Are there Alternative Names for the Brand and Generic Myrbetriq? The brand Myrbetriq comes from Canada and is manufactured by Astellas Pharma. There is no generic available for this medication. What Dosages and Forms is Myrbetriq available in? 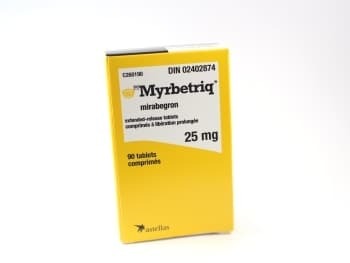 Myrbetriq is available in the strength of 25 mg and 50 mg tablets. What is Myrbetriq used for? Myrbetriq (Mirabegron) is a prescription medication that is used to treat the symptoms of overactive bladder. Mirabegron belongs to the family of medications called antispasmodics. This medication works by relaxing the bladder muscles which helps the bladder hold more urine and lessens symptoms of overactive bladder. Overactive bladder causes a sudden urge to urinate that may be hard to control, frequent urination and involuntary loss of urine. This medication should be taken with once daily with or without food as directed by your doctor. What are the Possible Side Effects of Myrbetriq? Are there any Precautions or Drug Interactions for Myrbetriq? You should not use Myrbetriq if you are allergic to Mirabegron or if you have severe kidney or liver disease. Before you start taking this medication, talk to your doctor about your medical conditions and about all the medications you take including OTC and herbal medications. It is unknown whether Mybetriq will harm an unborn baby. Inform your doctor if you are pregnant or plan to become pregnant. Myrbetriq passes into breast milk and may harm a nursing baby. You should not breast-feed while you are using this medication. This medication should not be used by anyone younger than 18 years old. This medication may make you dizzy. You should not drive, use machinery or do any activity that requires you to be alert. Limit alcoholic beverages. Myrbetriq should be stored at room temperature away from light and moisture and out of reach of children and pets. This medication should not be stored in the bathroom.